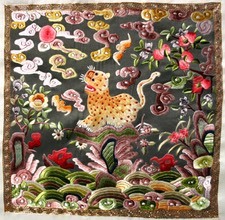 A number of pieces were embroidered specially for� the ‘Silk Legacy’ exhibition. 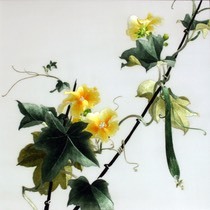 They were kept largely under wraps over the many years of preparation and shown publicly for the first time at the Exhibitions. 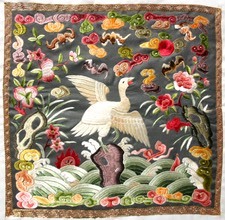 Among the exhibits were also pieces stitched in the traditional way by embroidery enthusiasts from around Australia, New Zealand and Europe. 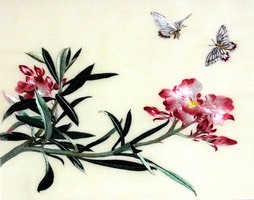 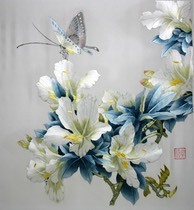 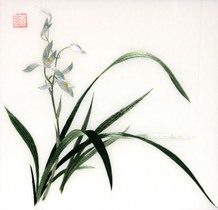 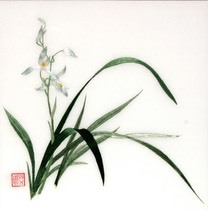 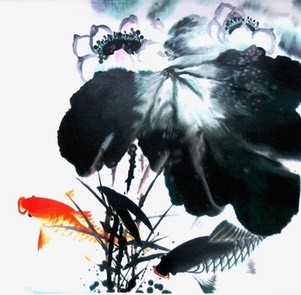 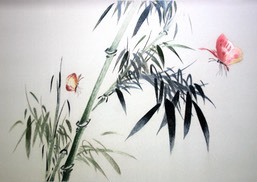 Butterflies in Chinese culture symbolize longevity, love and happiness. 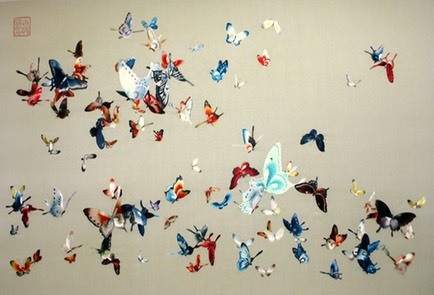 This painting of a hundred butterflies is well known. 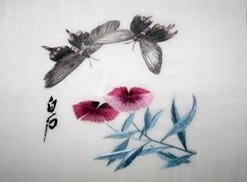 The display of colours presented by this group of flying butterflies, embroidered �using very fine silk threads portrays a feeling of lightness, freedom and happiness. 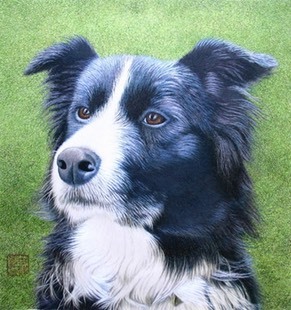 Morag is a special dog belonging to Gilian and Duncan Smith of SA. 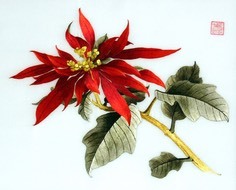 She has the ability to detect persons with a diabetic condition. 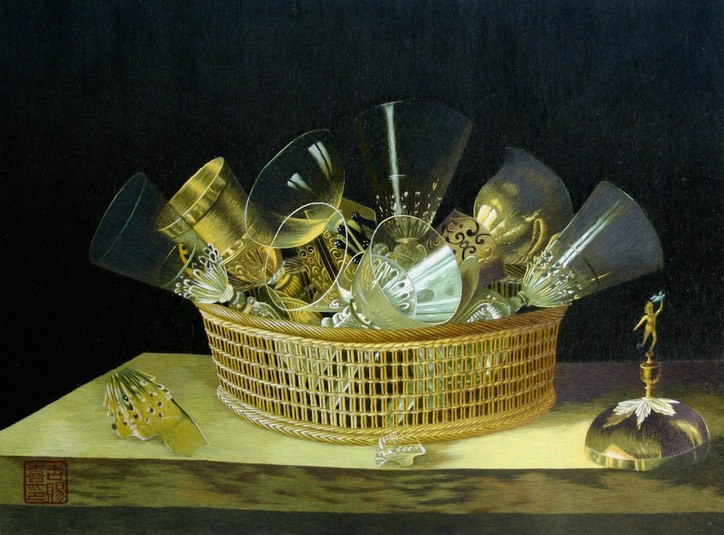 The challenge of this design was to capture the translucent quality of the glasses and the characteristics of the materials for the different objects - the rattan of the basket, the wood of the table and the metal of the goblets. 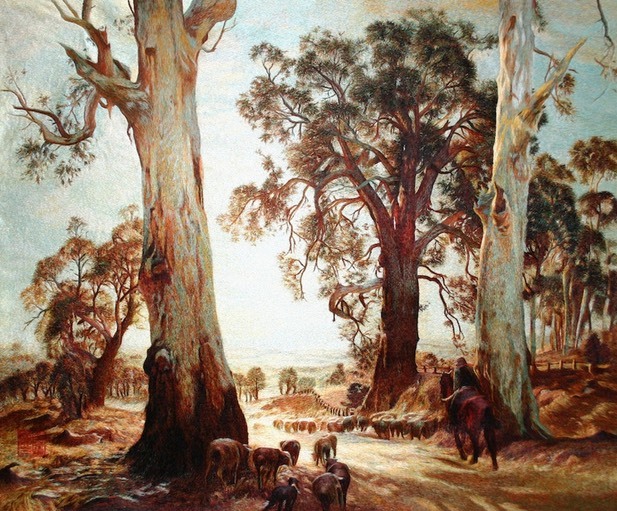 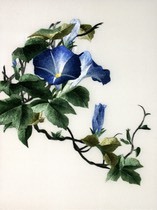 It was the light depicted in the painting that inspired. 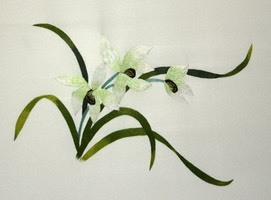 The challenge of recreating the ambience was an exciting propect. 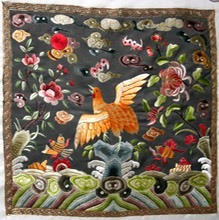 The embroidery process itself has been a great journey of discovery. 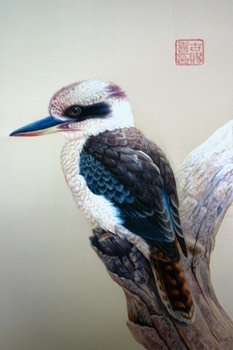 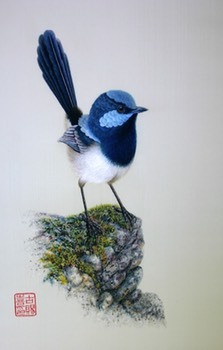 For the exhibition Margaret collaborated with prominent South Australian artist Jeremy Boot and embroidered a series of Australian birds based on his paintings. 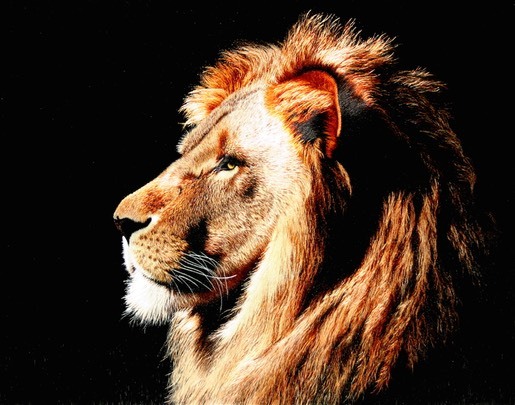 Its majestic pose is captured in this picture, perched atop a rock surveying his realm. 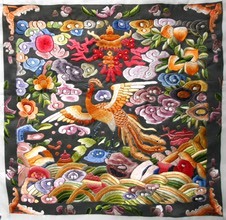 This design is steeped in meaning as cranes hold a special place in Chinese culture. 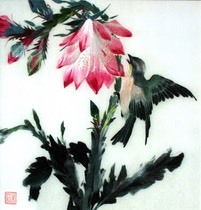 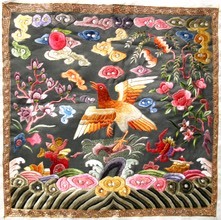 As the longes living in the bird kingdom, it symbolises longevity. 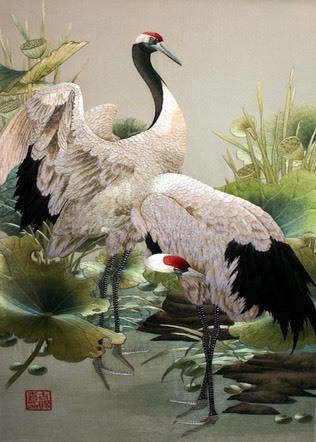 Cranes mates for life and in a family, both male and female work together in building the nest and raising their young. 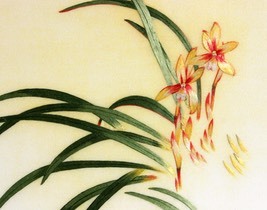 They are therefore considered to be symbols of happiness, good luck and fidelity in marriage. 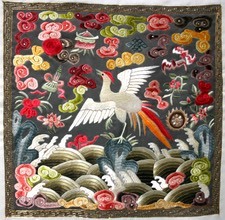 In this picture, the cranes stand in a lotus pond where only lotus pods and leaves are represented. 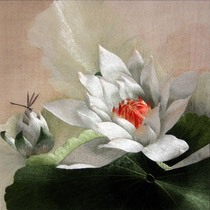 Lotus pods, when ripe, carry many lotus seeds and symbolises ‘plenty’. 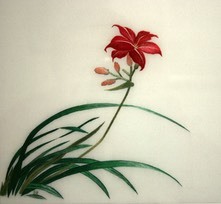 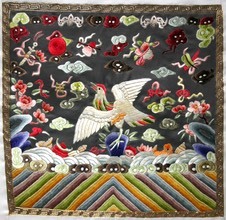 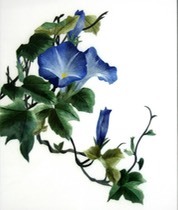 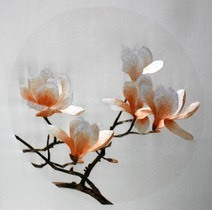 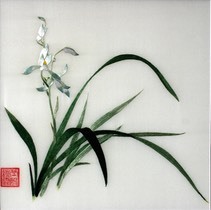 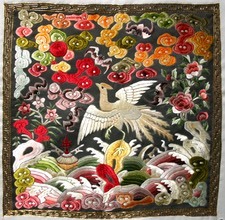 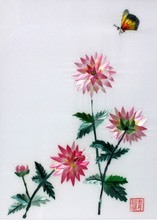 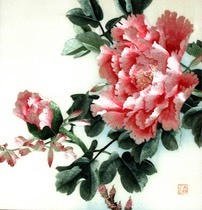 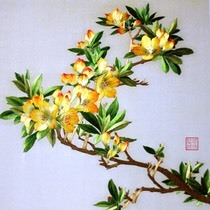 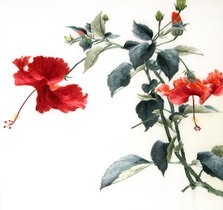 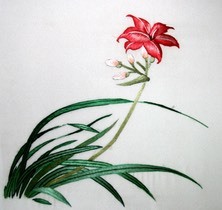 Lotus seeds and wall hangings with cranes are often displayed in a traditional Chinese wedding. 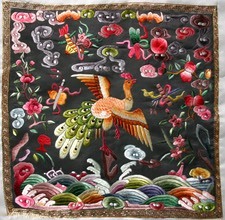 Images of peacock displayed in a Chinese home are considered to promote good providence. 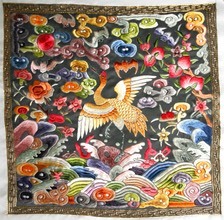 Chinese lore has ascribed 9 virtues to the peacock. 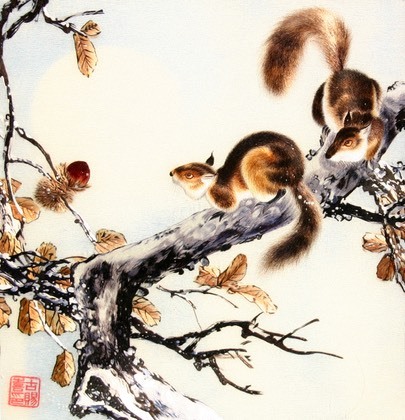 They have a tidy face, clear voice, careful walk, good and appropriate behaviour, contended, moderate in food and drink, not being obscene and always returning. 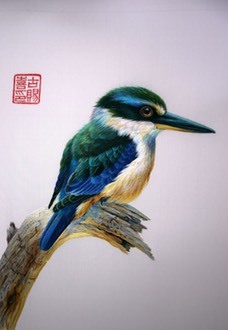 They are also a symbol of authority. 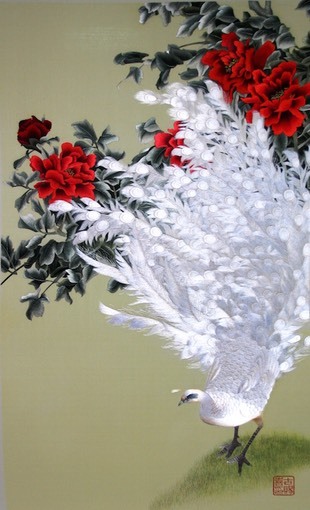 � �Based on a painting by Zhou Tianjin. 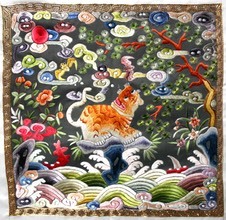 Rank Badges represent the most well known use of embroidery in government in China's history.� The badges,� also known as Mandarin Squares, were worn by military and civilian officials of the Ming (1368-1644) and Qing Dynasties(1644-1911).� The embroidered squares identify the rank� and role of the� official by the animal or bird symbol represented. 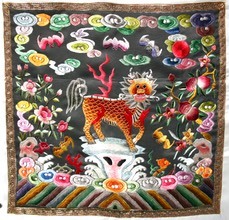 There were 9 ranks each for the civil and military service. 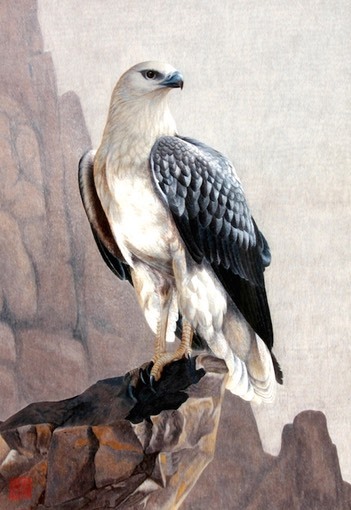 The animals depicted� for the civil service were drawn from the bird kingdom while that for the military service were from the animal kingdom or mythical animals. 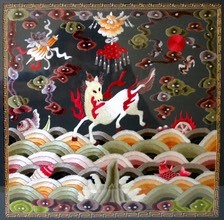 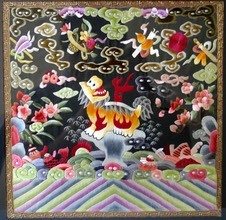 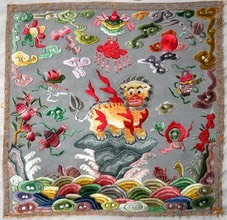 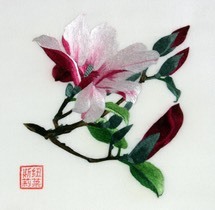 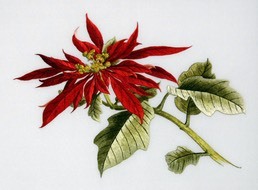 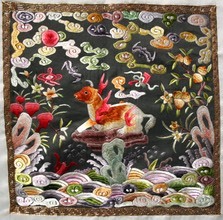 This series of embroideries are from Margaret Lee's private collection.